The Saltwater Crocodile (Crocodylus porosus) is one of two species of crocodile found in Australia; the other being the smaller Freshwater Crocodile (Crocodylus johnstoni). Subspecies or races have not been described. Top End waterways are some of the best remaining habitats for saltwater crocodiles in the world. There is estimated to be over 100,000 saltwater crocodiles in the NT at the moment. A large proportion of the coastal region of the Northern Territory is an ideal habitat for saltwater crocodiles, particularly the big, productive “coastal” wetlands and rivers. Much of the Queensland coastline is in the cooler, more southerly latitudes, which is less optimal habitat for crocodiles. Much of the habitat on the east coast has also been significantly altered and fragmented by human settlement. Western Australia has saltwater crocodile habitat around the Kimberley coastline but this area is not as rich in mangroves and wetlands as the Territory coastline. In the southern part of its range, winter temperatures reach a threshold below which crocodile eggs will not hatch and the longer cold periods significantly lower crocodile growth rates. The effect of a cooler climate on crocodiles can be seen in those animals kept in wildlife parks in southern Queensland. The crocodiles do not feed over winter as they cannot absorb enough warmth to digest food. Crocodiles have been around for 200 million years, and are a descendant from the dinosaur age. What is the full taxonomic name for the saltwater crocodile? The Australian saltwater crocodile is one of the most aggressive and dangerous crocodiles. It is also the largest living reptile, exceeding the Komodo dragon in size. Sexual dimorphism (difference) is present in this species, with the females normally growing to more than 3 metres and males normally up to 6 metres. Crocodiles up to 10 metres have been recorded in the wild in the past, but are extremely rare. Saltwater crocodiles have very large heads. A pair of ridges runs from the eyes along the centre of the snout. The eyes, ears and nostrils are located on the same plane on the top of the head, allowing it to see, hear and breathe while almost totally submerged. The eyes have a special second pair of eyelids known as the nictitating membrane. These eyelids are clear and protect the eyes while underwater. The ears, situated behind the eyes, have flaps which also close while underwater. The jaws are heavyset and contain 64-68 teeth. The teeth in the upper jaw are perfectly aligned with those in the lower jaw. The fourth tooth on each side of the bottom jaw is larger than the other teeth and is visible when the mouth is closed. What is the habitat and distribution of the saltwater crocodile? The saltwater crocodile is a mostly aquatic animal that spends little time on dry land. Saltwater crocodiles inhabit coastal rivers and wetlands, the open sea and island shorelines, and extend well inland via major rivers and floodplain billabongs into freshwater rivers, creeks and swamps. They are distributed widely in the Asia-Pacific region, including Australia, Papua New Guinea, Indonesia, Timor Leste, Malaysia, Myanmar, Sri Lanka, Philippines, Singapore, India, Bangladesh, Vietnam, Thailand, Solomon Islands and various other islands in both the Pacific and Indian Oceans. They are locally extinct from the Seychelles islands. In Australia, saltwater crocodiles occur in high densities in freshwater wetlands, floodplains and in the tidal portions of some mangrove-lined rivers. Saltwater crocodiles may occur in any salt or fresh water within their range. Large male saltwater crocodiles are known to defend their area and females defend their nest from predators. Within Australia, there are two species of (true) crocodiles: the saltwater (or estuarine crocodile) and the endemic Australian freshwater crocodile. Saltwater crocodiles are found in both tidal and freshwater areas. Saltwater crocodiles are naturally found long distances upstream into areas dominated by, and considered typical for fresh water crocodiles. Fresh water crocodiles are only sometimes found in tidal, saline areas. Within the Northern Territory, freshwater crocodiles were protected in 1963 and saltwater crocodiles were protected in 1971. The size of the saltwater crocodile prey is only limited by the crocodiles own size and strength. Saltwater crocodiles mostly eat fish, but will eat almost anything that they can overpower which can include turtles, goannas, snakes, birds, livestock (cattle), buffalo, wild boar and mud crabs. Hatchlings and juvenile crocodiles feed on insects, crustaceans, small reptiles, frogs and small fish. Saltwater crocodiles were once hunted extensively in Australia by humans for their skin which is considered internationally to be the best hide from the world’s crocodile species. In many countries, including Australia, hunting is now illegal, yet around the world there is still some illegal poaching. In some parts of the world they have been almost hunted to extinction, due to the value of their hide, habitat clearing and their reputation as man-eaters. Humans aren't the crocodiles’ only threat. Feral buffalo destroy nesting habitats and goannas can dig out eggs from nests. Hatchlings or juveniles can be eaten by barramundi, turtles, freshwater crocodiles and older saltwater crocodiles. Additional threats to the long term survival of the crocodile include habitat modification and encroaching human populations and the possibility of climate change induced sea level rises altering suitable habitats. Saltwater crocodiles reach sexual maturity at 10-12 years for females and males at 16 years. Females build mound nests from vegetation between November and May, and an average of 50 eggs are laid. If the nest is around 31.6°C, all the eggs will hatch as males. Above 33°C or below 31°C the crocodile eggs will hatch as females. The eggs hatch from 75 days. Only 1% of the hatchlings are thought to survive to maturity in the wild. 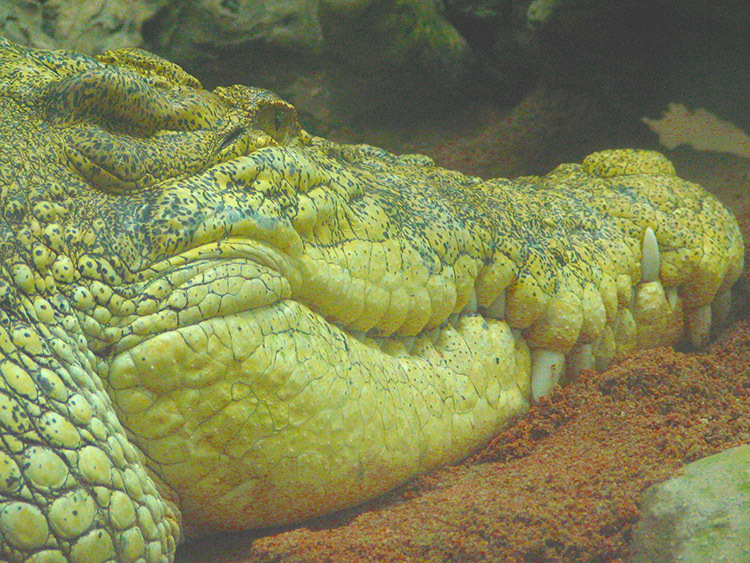 Saltwater crocodile eggs vary in size. The average saltwater crocodile egg weighs 113 grams and the average hatchling weighs 72 grams at a total length of 29.3 cm; their head length is 4.3 cm and snout to cloaca length is 13.8 cm. Females usually reach maturity when around 2.3 metres in length. Males mature at around 3.3 metres. Farmed crocodiles grow faster and mature earlier that those in the wild. Estuarine Crocodile, Saltie, Croc, Indo-Pacific Crocodile, Singapore Small Grain, Baya, Buaja, Buaya maura, Gator.